The Pin Cushion Plant is also commonly known as a Bead Plant or Coral Moss. 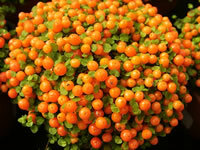 It is a fast growing tender perennial that produces an abundance of tiny orange berries just in time for Halloween! 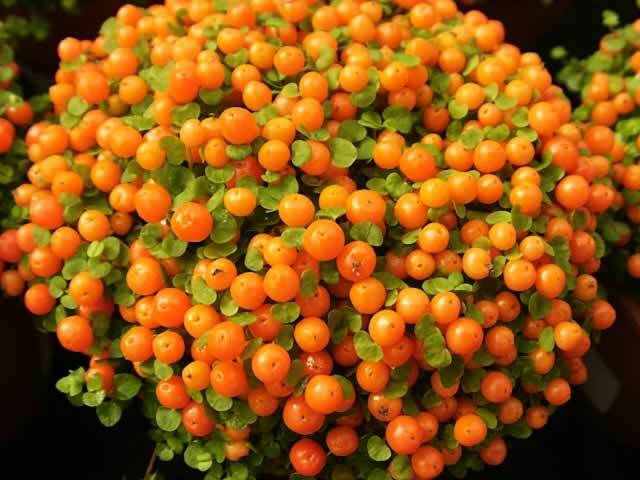 Pin Cushions require full sun or they will produce a lot of foliage and very few berries. In hot summer regions, they maay need partial shade.. They should be planted in a sandy, well draining soil. Give your Pin Cushion plant a half strength dose of a good all purpose fertilizer in early spring and mid summer. Keep the soil evenly moist but not soggy. Pin Cushion Plants are an excellent choice for growing in containers. 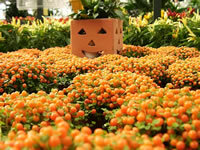 If they are grown as house plants Pin Cushions enjoy spending their summer months outside in a sunny location, but must be moved back indoors before the temperature drops below 55 degrees F.
It should be kept in a sunny location with a room temperature of 65-70 degrees. When active growth slows during the winter, watering should be cut back. Never allow the pot to stand in water! Sow Bead Plant seeds indoors at any time if you intend to grow them in a greenhouse or as house plants. Nertera seeds require darkness for germination so be sure to cover them well! Germination will take place within 20-25 days. Pin Cushion Plants can also be easily propagated by division.